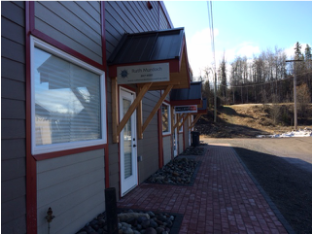 My office is located on the side of the Village Office building in Telkwa. Hankin Ave. is the last cross-street before proceeding up the hill onto Highway 16 East. Turn right onto Hankin Ave. and immediately turn left into the parking lot of the Village Office. On the right side of the building, you will see three units, each with a small roof over its entrance. My office is the first unit, closest to Hankin Ave. You'll see my sign once you turn into the parking lot. Hankin Ave. is the first intersection at the bottom of the hill as you enter Telkwa. Turn left onto Hankin Ave. and then immediately left again into the parking lot of the Village Office. On the right side of the building, you will see three units, each with a small roof over its entrance. My office is the first unit, closest to Hankin Ave.